It’s time to spring clean…..
Today the sunlight is shining through my clean windows and its making me happy. I’m not a natural cleaner and I often leave it till it really needs doing so any help in the cleaning direction is well received here. Luckily for me e-cloth send me a great range of environmentally friendly products to lend a helping hand. E-cloth is pretty revolutionary. It traps dirt, grease and bacteria leaving your surfaces squeaky clean and grime free – all using nothing but water. All the e-clothproducts are guaranteed for up to 300 washes! I have to say whilst this opunds great i was a bit concerned that it wasn’t goung to give quite a good enough clean. First up there is a new two cloth e-cloth Bathroom Pack. It has a new fluffy absorbent cloth to remove thick grease and dirt from the bath, shower and surrounding tiles as well as a polishing cloth to leave a smear free finish! Fordelicate surfaces with e-cloth’s Non-Scratch Scouring Cloth. The cloth is dual sided so you can remove stubborn grease and dirt with water alone without having to worry about damaging surfaces. 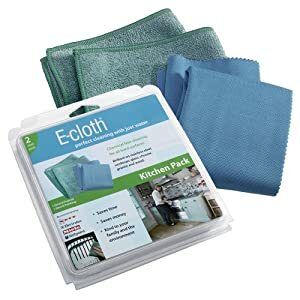 For all other areas of the kitchen there is e-cloth Kitchen Pack. The pack contains a Kitchen Cloth, with scrubbing pocket, for all round cleaning and a Glass & Polishing Cloth . Finally for all other areas of the home, use the e-cloth General Purpose Cloth to remove all kinds of dirt and grease, along with over 99% of bacteria. Simply wet and wipe! The e-cloth range is available from all major supermarkets, department stores, DIY and gardening centres and online from www.e-cloth.com. I was really surprised how good this was but I have to say for a couple of really stubborn stains it was a lot of effort. Overall though a big thumbs up and I will be using them regularly. Previous Post What Should You Call Your Baby In 2012? I have the bathroom pack and love it!